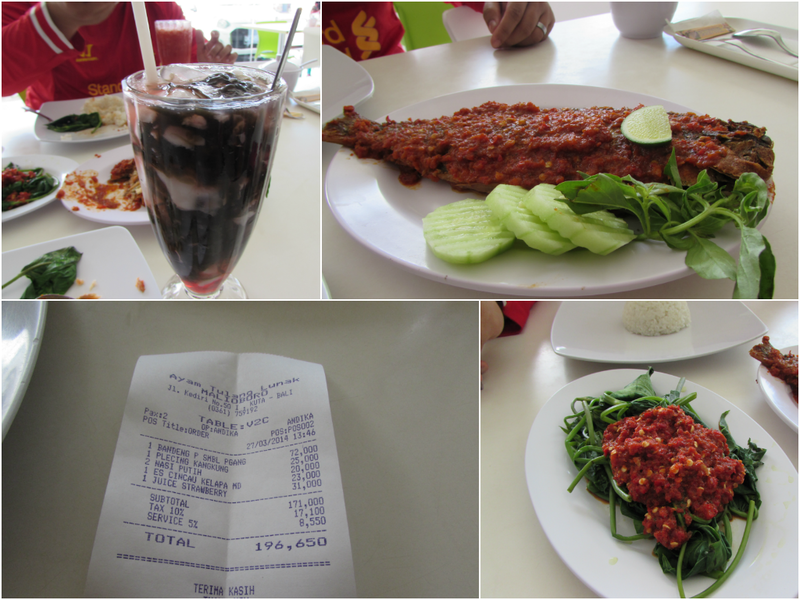 Our first destination upon arrival in Bali was getting our lunch at Malioboro Restaurant located at Jalan Kediri No. 50 Kuta, Bali. They served halal food and their special dish was Ayam Tulang Lunak. But hubby and I decided not to eat chicken at the moment, we opt for seafood dishes and we ordered white rice, water spinach with condiment and grilled fish. It costs us about IDR 197,000. 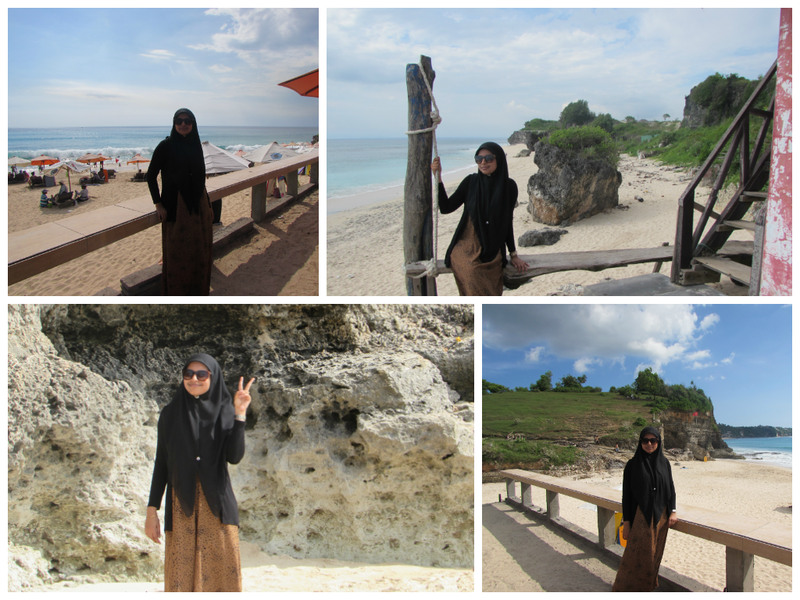 We then proceed to Dreamland Beach which is very appealing to eyes. It located in the Southern Bali and it is about 30-45 minutes away from Kuta. We were dazzled with the stunning rock cliffs on which there is a green pasture that is high enough. Many foreign and local tourists who like to enjoy in the meadow area. Dreamland Beach is also one of surfing destination in Bali. 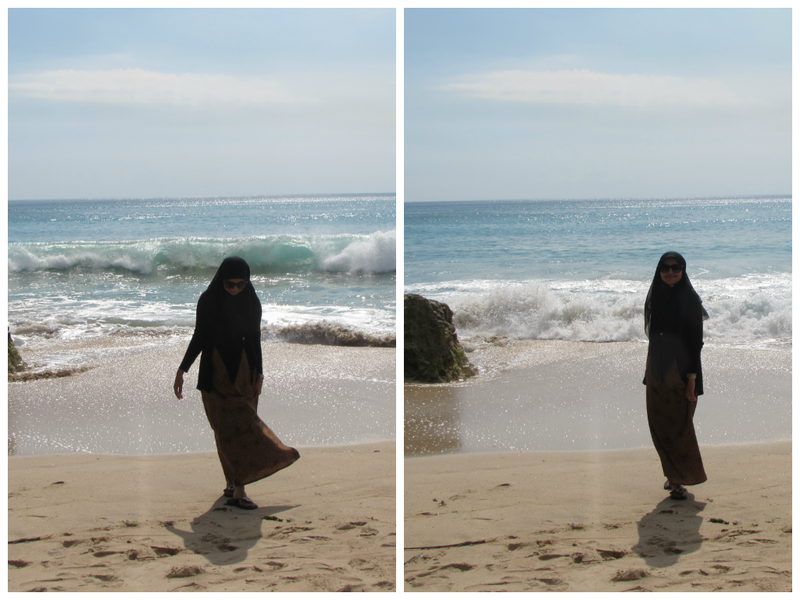 Since hubby and I haven't unpacked our clothes in the luggage, we opt for sightseeing and took pictures at the beach. We then stopped by at Masjid Agung Palapa in Pecatu, Bali for Jamak Qasar prayers. This mosque is an open space mosque and it is big enough which I think able to accommodate about 500 peoples at one time. I saw many small kids came here and learned Al-Quran with the Imam. Our supir (chauffeur) brought us to Padang-Padang to taste the original Bakso which I think is a must-try halal bakso here in Bali. This crap photo (I quickly learn that hot humid weather fogs up camera lenses) simply cannot convey how incredibly, amazingly, freaking delicious this food was. The oh-my-god moment came from the meatball. Equally amazing is the tofu, wontons and the veggie (mix of greens and mustard). Also served with some noodles which seem really popular in Bali. Sedap. Seriously! Late that evening we went to Uluwatu Temple to experience the famous traditional Balinese theatrical performance, the Kecak and Fire Dance. It's the Balinese adaptation of the Sanskrit epic, Ramayana. The venue for this performance is in a temple on a cliff, overlooking the ocean. The view was spectacles and amazing. The audience is seated stadium-style, encircling a disc-shaped platform. The sun's rays constantly teased our eyes and as the stadium fills up, an intricate, altar-like pillar is lit. It burned on as the clouds in the distance slowly moved past our stage. The Kecak dance is unique in that it's a theatrical performance where the acoustic entirely of chanting. We hear chants approaching the stage and roughly about 50 men form a circle, throw their hands upwards and chants " Kecak-Kecak-Kecak-Kecak", interspersed with some leading vocals and calls by the elderly members. In between key moments, a religious figure (Initially we thought he is a Pak Haji-wearing a kopiah-like Serban) showed up and blessed the performers. The original Ramayana is much longer story and Kecak picks a specific arc from this sprawling epic to serve as its highlights. The epic is condense and contained into a 2-hours dance performance, with some comedy dialogues, save from an intermission by a comedic relief. The story follows Rama and his beloved bride, Sita as they were walking through a forest.The demon king Rawana, bore a grudge against Rama and had his eyes set on Sita. He sent his underling to lure her, under the guise of a golden deer. Sita was enchanted by the golden deer and requested Rama for it. Rama, unable to turn down his beloved's request, begrudgingly left her by herself. After that, Rawana made his grand entrance and in my opinion, his was the most memorable entrance out of all the characters. One of the Kecak dancers let out a roar and trailed it off with s sinister laugh. Rawana came with a very impressive costume. The shoulders went straight into his neck and beard and his sleeves were puffed up. Next came the star of the show (and the crowd's favorite). The Hanuman. The mightiest warrior amongst the monkey clan. There was no special music or cues to announce his presence, just gasps of the audience. He climbed over the stadium seats and hop towards the stage, making his way towards the stage. He's a symbol of loyalty and steadfastness, here to assist Rama in rescuing Sita. The presentation is superb, performed right at the edge of a cliff, the sun played a part in this story. Rama and Sita entered the forest with the sun at its brightest, it dims itself slowly as Rawana made his entrance and swayed from hues of orange and dark purple as Hanuman fights Rawana. The sky calmly settled into a deep blend of indigo, accented by dark blue sky. The sun had set, the struggle between good versus evil was over and the ocean breeze signaled that it was time to head home. This photograph, unedited and taken with my Canon is a testament to the beauty of the scene. Before we head to our hotel in Seminyak, we had a romantic candle light dinner by the beach in Jimbaran Bay where various seafood restaurants lining up at the seashore. You just need to simply choose one. The beach is very well lit but please mind my Canon was fogged, therefore a very poor quality of pictures we had that night. We spend our night enjoying the breeze of the sea, sandy beaches and songs entertained by the performers. They sang very well english, spanish and indon songs!